If you are the owner of a Ranger Tug, we have you all covered. We carry all patterns for Ranger Tug and have especially created a Topper Sleep System to provide the comfort that all you Ranger Tug guys out their desire for. The five cushion beds are nowhere close when we talk about a good night sleep and comfort. Our designer came up with a great solution. Our Topper System was designed to increase comfort, make the task of making the bed easier and keep your boat looking ship shape. Our 3″ topper will sit directly on your existing cushions; our custom sheet set will fit onto the topper and the custom quilted bedspread will lay right on top. What more can you ask for. All that struggle in making the bed and putting those sheets on is over. For this Ranger Tug 29 client, we did the topper sleep system. The image shows the beautiful transformation of the bed. Our custom topper with custom sheets and the custom quilted coverlet in the Azure fabric; one of our most popular, solid shams and fun Reef throw pillow creating an inviting design. Visit our website and you will see our Ranger Tug section right on our Home page. That will take you to our Topper Sleep System. Our topper System includes a Custom 3-inch topper, a Custom sheet set including a fitted sheet, flat sheet and matching pillow cases and a coverlet. There is a wide variety of fabrics available for you to choose from and you can add your desired shams and throw pillows and mix and match all our fabrics to create the style and design you prefer. We have a bunch of images that can help you visualize the whole transformation of this Topper Sleep System. A great night sleep on your Ranger Tug was never easier. 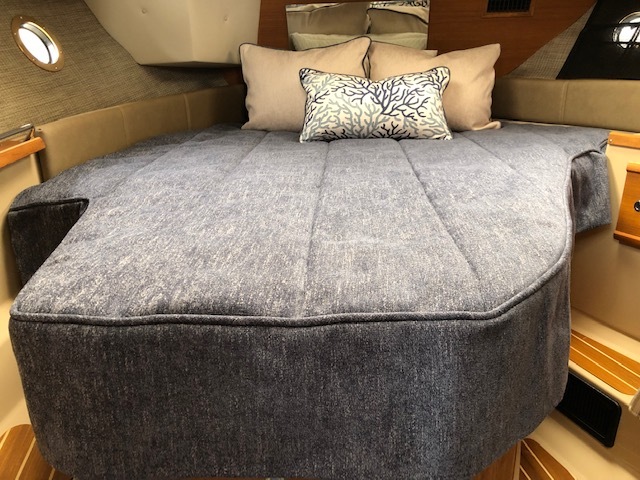 You will enjoy your night time on your boat as much as your days and with our custom topper and custom bedding, you will realize that making the bed is now a breeze. At Yachtbedding.com, our goal is to provide the ultimate satisfaction to our clients taking care of their desires and needs. Our design team is always available to help you out if you have any questions about our products and services. We thrive to make the selection process as smooth and simple as possible for you so you can enjoy and we can transform your stateroom into your Dream room.